WIM Vantika Agrawal won again National Child of the Year award 2017 for exceptional achievements in Chess ! GCA Coaches Sandeep Chitkara and Akshay Anand won prizes at Delhi International Open 2018 !! Mr Sandeep Chitkara with his students Vantika Agrawal & Anishka Vikram at World Youth! GCA Coaches Sandeep Chitkara, Aryan Singh and Akshay Anand won prizes at Delhi International Open 2017 !! GCA Coach Akshay Anand won Delhi State Seniors FIDE Rating Chess Championship 2017!! GCA Coach Aryan Singh got 4th position! GCA Coaches Akshay Anand and Aryan Singh won Punjab State Open Chess Championship 2016 and Delhi State U 25 Chess Championship 2016 respectively !! Vantika Agrawal of Genius Chess Academy won the National Child of the Year award for exceptional achievement in Chess ! Rosh Jain won National Schools Under 7 Chess Championship 2018 ! 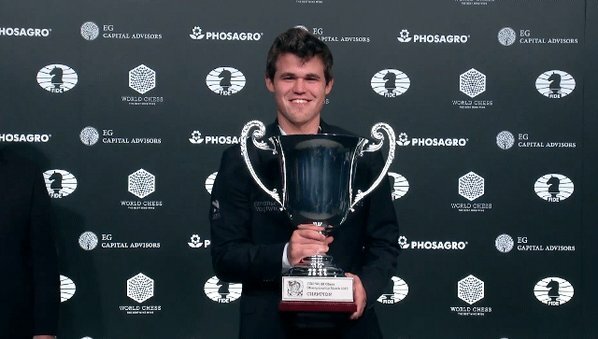 Magnus Carlsen of Norway retained his title when he beat the Russian challenger Sergey Karjakin 6-6 (Classical), 3-1 (Rapid Tiebreakers) to win the FIDE World Chess Title for the third time at New York on November 30, 2016. Carlsen celebrated his 26th birthday in style, winning the four game rapid contest that lasted 209 moves in all on the final day. This was the best the spectators got in lower Manhattan venue of New York. Top 10 Trophies & Consolation prizes in each category !